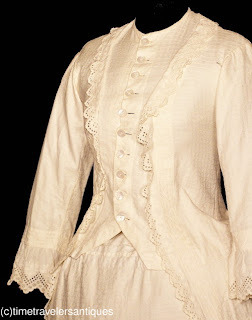 An original circa 1882 young miss's white dimity two piece bustled Summer dress with a faux jacket having a shell button front closure, trimmed in eyelet lace that repeats at the cuffs and above the pleated hem of the unlined skirt front that has a shell button back closure. Recently de-accessioned from a New York State museum collection. 14" from shoulder to shoulder, a 32" bust, 26" waist, and 51" from shoulder to front hem. In good clean sound as found condition, with a tuck let down below the waistband, a few organic spots to one elbow, some fray to one armscye, and one 3/4" fray line near one shoulder, along with a few pin dot to 1/4" spots. 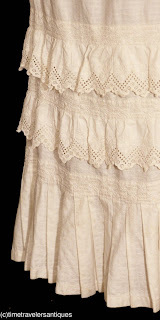 All is reflected in the reserve price for this charming Victorian era Summer bustle dress. Wouldn't this be fun to watch the Fireworks in this evening? Just lovely! I rarely get to see a dimity bustle dress.